In the last few weeks I’ve found myself having numerous (nay, endless) conversations with colleagues about the magazine industry. Titles, even those that only a year ago were doing pretty well have seen devastating plunges in circulation which, let’s call a spade a spade here, means their readers are actively rejecting them. 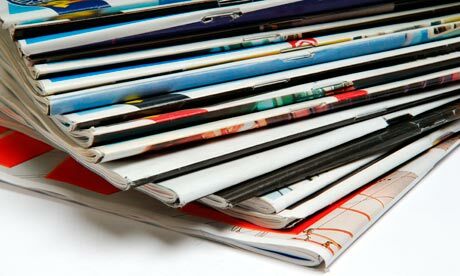 As a former editor myself, I sympathise hugely with the people who helm today’s magazines. In my day, the internet was still its infancy, the market was still bouyant and the hot topic in the industry wasn’t survival but whether you should really stoop to sticking sunglasses on your cover to boost sales. Much is made, of course, of how the internet has utterly decimated the industry (to a degree it has but then, did no-one in the big publishing houses see that coming?) but let’s not make out print media itself is blameless here. Whilst pioneering and offering an entirely different business model to conventional magazines and newspapers free titles like Shortlist and Stylist (and then the Evening Standard) didn’t just shake up the market, they mortally wounded it in the process. Don’t get me wrong, all three are excellent publications but, to me, the fact that they are handed out like club flyers devalues the idea that journalism and photography have an intrinsic value. After all, if there were people standing outside your local train station handing out free household cleaner every week would you ever consider paying for it? Unless I wanted really good household cleaner I know wouldn’t. So how do magazines survive? In truth, I don’t have the answers and I share the pain of those who are expected to come up with them – especially as they’re increasingly expected to offer more bang for a diminishing buck (and with fewer staff too). I suspect the glossies will hang on in there because they’re still able to do what most websites, blogs and free publications can’t – they can provide luxurious, decadent content, spread over numerous pages. Vogue can still do the indulgent 12-page fashion shoot in Machu Picchu with three world-class supermodels and Men’s Health can still do a six page in depth-feature about men and mental health. At some point we’ll get sick of the two-paragraph stories magazines are so fond of feeding us these days and will demand the read again. Or maybe the industry survives by stealing some tactics from the music industry, with which is largely comparable. In the same way the music industry has responded to falling sales and pirating by turning music in to an artefact – producing high value special editions, boxed sets and collector’s sets – I can see some magazines producing high-price issues and limited editions (Vogue logo in real gold anyone? Limited edition Lady Gaga cover signed by…Lady Gaga?). Certainly more will have to do digital (I subscribe to a couple of digital editions of popular magazines so can’t see why people won’t cough up if the content and – crucially – the interactivity is there). Others will have to think out of the box – not replicating what the internet can offer (that USP is taken) but delivering what it cannot. As for the weekly gossip titles I honestly don’t know what the future holds for them. I loathe the Daily Mail‘s website but as much for its genius as what it stands for. After all, if a reader wants to see what shoes Helen Flanagan is ‘walking out in/showing off’ on any given Tuesday why would they wait until the following week to find out when the Daily Mail is scrutinising her every move on an almost hourly basis? There are those that advocate a charity-like approach to the salvation of the magazine industry, imploring us to ‘use ’em or lose ’em’. I sympathise with the sentiment but that’s an awful lot like saying we should have shopped in Woolworths just to save it from closure. Yes it was a dearly-loved institution but it closed because it couldn’t keep up with its customers’ changing needs and, as a result, was fundamentally…rubbish. If magazines are to survive they have to earn our love again. Though I work mainly in the digital arena these days I spent half of my working life in magazines and have a real and genuine affection for the format. And I really hope they make it – or at least that the deserving ones do – as much as anything because I don’t want to see all those talented journalists, subs and designers out of jobs, not to mention all the other creatives who rely on their existence. But at the end of the day, there might well be a case for doing the decent thing and putting some titles out of their misery. When your number’s up, your number’s up – especially when that number’s down 40% year-on-year.